Fifty years ago, long before Common Core and STEM became buzzwords amongst educators, librarians, and children's literature experts, there were the Science I Can Read books. These were books for early elementary readers written by Millicent Selsam and illustrated by Arnold Lobel, which used stories to illustrate and explain simple scientific concepts. At a recent used book sale, my husband found a copy of Greg's Microscope, which we decided to add to our family collection, mostly because I love Lobel, but also because we are fans of the classic I Can Read Books. 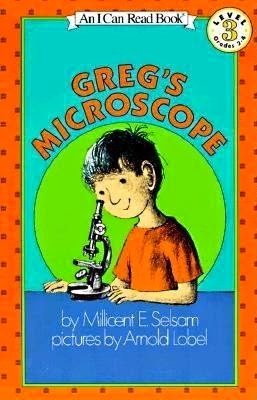 It is the story of a boy named Greg who decides he wants a microscope after seeing one at a friend's house. His father agrees to get it for him, but tells him he needs to prepare his own slides using materials from around the house. Greg begins looking at everything - sugar, salt, dog hair, his own hair, and more - and soon his parents are as obsessed with the microscope as Greg is, prompting the family to question whether just one microscope is enough! Because of continual scientific advances, not all science books can stand the test of time. This one, however, seems like it is still a decent introduction to microscopes for the early elementary audience. Lobel adds much to the book with his sketches of each item Greg views under the microscope, which give kids who don't have access to expensive scientific tools the opportunity to learn what each of these things looks like when magnified. Because of the level of detail in the illustrations, the book also makes a perfect companion to a classroom lesson or library program where kids look into the microscope and record what they see. Reading the book as a group and repeating Greg's actions seems like the ideal STEM activity. Only one minor detail in this book bothered me. Greg's mother is portrayed as almost unbelievably clueless. She acts as though she has never heard the word "cell" before and just generally seems like she has no idea about the world outside of her home. While this is probably meant to empower the child reader - "Hey, I'm smarter than the grownups!" - it did make me roll my eyes, and it kept me from giving the book five stars. It won't, however, prevent me from adding it to my homeschool stash for when Miss Muffet is older. I had this one! When I was about 6, we got the I Can Read Books in the mail. It was wonderful, especially the summer I was bedridden with horrible earaches. Yes, just like in all of those books where children aren't allowed out of bed. I doubt they treat earaches like that any more!